Energy is emitted to space from many different heights in the atmosphere, depending on the wavelength (not to scale, suggestive only). One more quick post of mostly uncontroversial foundation for the math-and-physics-heads among us. But it’s a must for anyone who wants to talk Stefan-Boltzmann and follow the details of the next posts. My intro here, just has the gist without the equations. 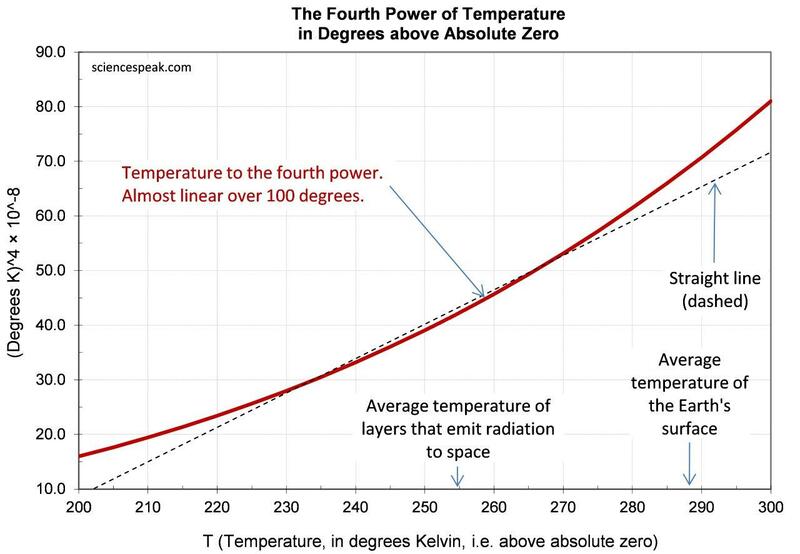 Mostly the IPCC will agree with this post, but they might be a bit snooty that David thinks their “effective temperature” is too much of an approximation conceptually, and the slightly more complicated idea of a “radiating temperature” is needed. Strictly, the effective temperature idea treats Earth like it is a black-body at infrared, which it isn’t really. Earth is almost a black-body, but not quite. There is no single layer that radiates to space, instead emissions come from many different heights, depending on the wavelength. We could average the emissions into “one layer”, but doing that would lose detail that matters when computing sensitivity to increasing CO2. Technically the Stefan-Boltzmann law is not supposed to be applied to Earth, because there is no single physical radiating surface to which to apply it. So this is where David introduces and defines the concept of “radiating temperature”, so it can effectively be applied. Dr David Evans, 2 October 2015, David Evans’ Basic Climate Models Home, Intro, Previous, Next, Nomenclature. Before discussing the third error in the conventional basic climate model (next post), we will review the application of the Stefan-Boltzmann law to Earth. This is the last of the foundational posts, predominately reviews to ensure readers can get up to speed on background topics. It’s not quite straightforward, because the Stefan-Boltzmann law applies to the emissions of a body with a single surface for all wavelengths, whereas the Earth’s outgoing longwave radiation (OLR) comes from multiple emission layers (see post 6). The emissivity is the ratio of energy radiated by the body to the energy radiated by a black body (one that reflects no radiation) with the same temperature. Emissivity is equal to absorptivity, and incoming energy is either reflected or absorbed — so emissivity is zero for a perfectly reflective body, while it is one for a black body, and in between zero and one for all other bodies. The Earth radiates all its heat to space as OLR. Thus the E in Eq. (1) is the Earth’s OLR R, for whose value we use the all-sky average OLR of 239 W m−2 from Trenberth et. al 2009 . Hard numbers on the Earth’s emissivity are scarce in the climate literature. The broadband emissivities of land and ice-snow are ~0.95 and ~0.99 respectively by Fig.s 3, 6, and 7 of Jin & Liang, 2006 . For water it is 0.9907 according to Appendix B of Wilber, Kratz, & Gupta, 1999 , though the emissivity drops quickly as wavelength increases (see their Fig. 1), and though quoted as broadband it does not seem to use data greater than 14 μm. From older data from Miriam Sidran, across a wide broadband range (1–100 μm), the average emissivity is 0.96 for water temperatures from 0 to 30°C (Science of Doom 2010). The emissivity of the Earth’s surface is taken here as ~0.96. However, of the 239 W m−2 of OLR emitted by the Earth, all but 90 to 100 W m−2 comes from greenhouse gases — principally water vapor, CO2, methane, and ozone. These gases do not reflect infrared, so their emissivity is one. 40 to 50 W m−2 comes from the surface or the water vapor continuum near the surface — the emissivity of the water vapor is one and the emissivity of the surface is ~0.96. The remaining 40 to 50 W m−2 comes from cloud tops, whose emissivity is one when the cloud is sufficiently bulky (Chylek & Ramaswamy, 1982 ) and are otherwise somewhat transparent to the surface. The emissivity of the Earth is taken here to be ~0.995. This says that the Earth is almost a black body at the infrared wavelengths at which it radiates OLR, though of course it is not a blackbody at visible wavelengths (because we can see it — it is in fact quite reflective, with an albedo of about 30%). The Stefan-Boltzmann law cannot be literally applied to Earth because there is no single physical radiating surface to which to apply it. Also that law, like the underlying Planck’s law, relates radiation to the temperature of the layer that emits it, so it cannot be applied to a layer that does not physically emit. We must tread carefully. This being the Stefan-Boltzmann equation applied to Earth, TR may be thought of as a temperature — which we call the “radiating temperature” of the Earth. In so much as the Earth has a temperature at which it radiates, this is it. By defining TR as the quantity which makes Eq. 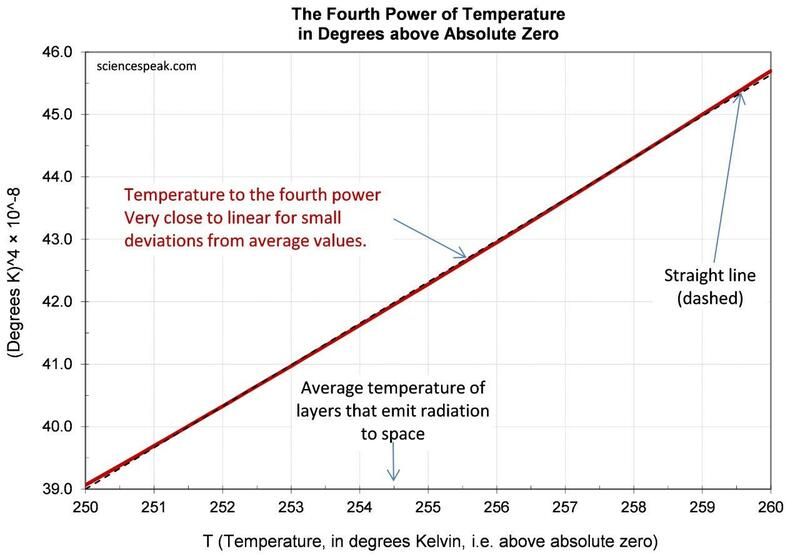 (2) true for a given R, we have effectively applied the Stefan-Boltzmann law to Earth — though at the cost of introducing a notional temperature TR that is some mixture of the temperatures of the physical emission layers. While the numerical difference between TR and Te is insignificant, here we are concerned with OLR from the real Earth so it is more natural to use radiating temperature (and technically incorrect to use Te, at least conceptually). It is the ratio of ΔTR to the corresponding ΔR, in all circumstances (quite unlike the Planck constant, which problematically requires holding everything except R and the surface temperature constant). The SBS is the slope of the Stefan-Boltzmann curve at the Earth’s current state. It may be regarded as a constant because the Earth does not stray far from this point — the effect of a change in λSB is second-order in the models here. Figure 1: The Stefan-Boltzmann curve is approximately linear over a 10 degree range, so its slope (λSB) is approximately constant: ΔTR equals λSB* ΔR. Figure 2: The Stefan-Boltzmann curve is still roughly linear over a 100 degree range. [1^] Trenberth, K. E., Fasullo, J. T., & Kiehl, J. (2009). Earth’s Global Energy Budget. Bulletin of the American Meteorological Society, March, p. 311. [2^] Jin, M., & Liang, S. (2006). An Improved Land Surface Emissivity Parameter for Land Surface Models Using Global Remote Sensing Observations. 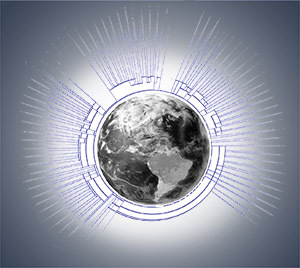 American Meteorological Society, 2867 – 2881. [3^] Wilber, A. C., Kratz, D. P., & Gupta, S. K. (1999). Surface Emissivity Maps for Use in Satellite Retrievals of Longwave Radiation. Langely Research Center, Hampton, Virginia: NASA. [4^] Chylek, P., & Ramaswamy, V. (1982). Simple Approximation for Infrared Emissivity of Water Clouds. J.Stmospheric Sciences, 171-177.